Trieste’s Friuli Venezia Giulia Airport lies a little less than 50 kilometres north of the city, which takes just under an hour to travel. Aside from there being a great deal of local Trieste sights to see, there are a lot of sights on the way to the city, and this makes a Trieste airport motorhome rental greatly worthwhile. 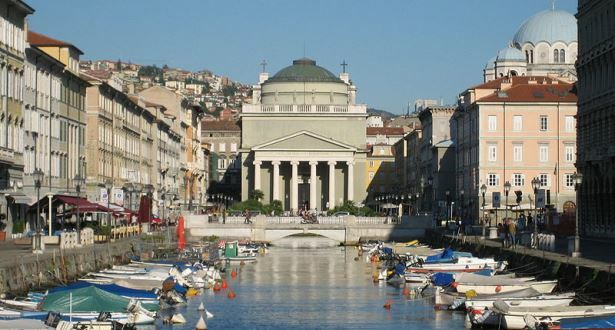 It also gives you the unique advantage of being able to truly experience Trieste and its surrounding areas without the ties that come from hotel accommodations and public transportation costs and restrictions. Take your Trieste airport motorhome hire and head directly to the campsite where you can get settled in. Campsites like Camping Villa Mare Pineta are located 18 kilometres from the city of Trieste and offer you the freedom to engage in outdoor activities in between trips to Trieste’s downtown centre. This is a great alternative since Trieste isn’t as large as cities like Milan and Rome, so you don’t need as much time to see it. Trieste is an older city, littered with treasures from medieval times when it was made a free port under the Habsburgs. To tap into this history, check out Citta Vecchia, or Old Town, which features intriguing crooked streets and medieval houses. This is a walking area only, so if you drive in, rather than take public transit, you’ll need to park your Trieste airport campervan hire outside the area and trek in. Trieste wasn’t always an Italian province. It was once under Austrian-Hungarian rule, and this portion of the city was built during that time period. The Austrian Quarter features elaborate palaces like those found in Vienna, Austria, as well as the Piazza Unita which lies along the seafront, a beautiful spot for a leisurely lunch and taking in a stroll and the fresh sea air while your camper hire in Trieste airport is parked in the campgrounds nearby. For those less inclined to venture out to the horseback riding, spelunking, hiking, and mountain biking playgrounds that Trieste offers, local wine and food areas like the Terrano Wine Road is a fantastic option. This trail north of the city is best experienced by recreational vehicle (RV) rental in Trieste airport because it links restaurants and cafes featuring local and regional wines and dishes from Veneto, Fruili, Slovenia and Austria. Once you’ve had a chance to experience the city, venture out with your motorhome rental in Trieste airport to the giant caves of the Trieste Carso region less than 30 minutes to the north. The three main areas of interest are the Grotta Gigante, San Canziano, and Postumia. Grotta Gigante is the largest tourist cave in the world that can be visited and hiked, so if you’re into nature and the outdoors, this is an absolute must-see. The latter two, the San Canziano and Postumia, are located close to the Slovenian border, so these are great sites to get to by Trieste airport RV rentals. Trieste is also less than 2 hours drive from Venice, so is a good location to explore Northern Italy by RV rentals. If visiting Slovenia is on your list, a Trieste airport motorhome rental is beneficial because it allows you to take in a little of both countries due to their close proximity. Slovenia’s capital and largest city, Ljubljana, is less than two hours northeast. The UNESCO-protected Skocjan Caves is about 30 minutes away by campervan hire in Trieste. Farther south but only less than two hours away by motorhome hire or campervan hire in Trieste airport is Croatia’s Pula, popular for its pleasant climate and flat seas, as well as Roman history, unspoiled nature, red and white wines and the precious olive oil of Istria.